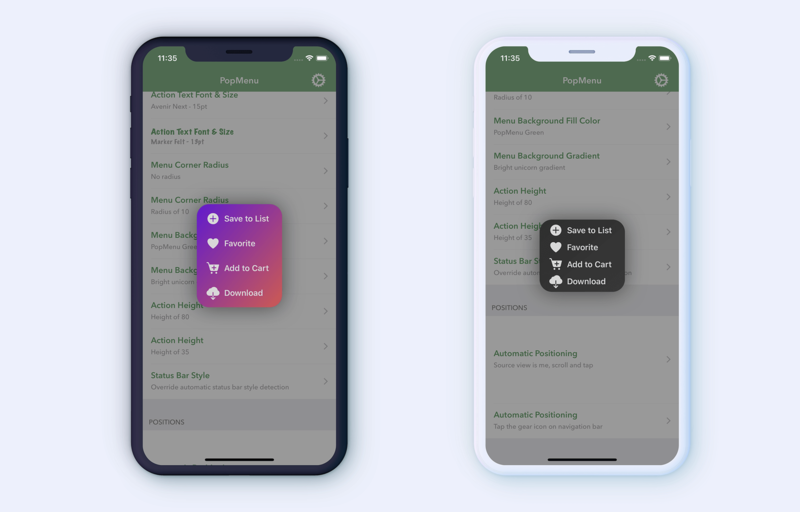 PopMenu is designed as a quick popup action menu, much like an action sheet in iOS. If you want an action sheet that looks great, you're in the right place! Full customization (icons, fonts, colors, background, styles, corners, height, status bar... you name it). Haptics enabled for selection or pan gesture. Download or fork the repo and open the given Example Xcode project to try it out yourself! ‼️ PopMenu was actually taken so let's call it NewPopMenu 'cause why not? You can, however, choose either way to have the same result, whichever works best for you. Use the default manager if you want quick setup and present menu seamlessly. Use the PopMenuViewController class directly if you want to have more control. That's how you set the actions for the menu. Both should work just fine, but still, using manager.present(on: ...) manually would be a safer way to go for presenting. If you are using PopMenuManager to handle PopMenu, you can skip this section. // Use manager to present menu. variable of PopMenuManager.default called -> manager. 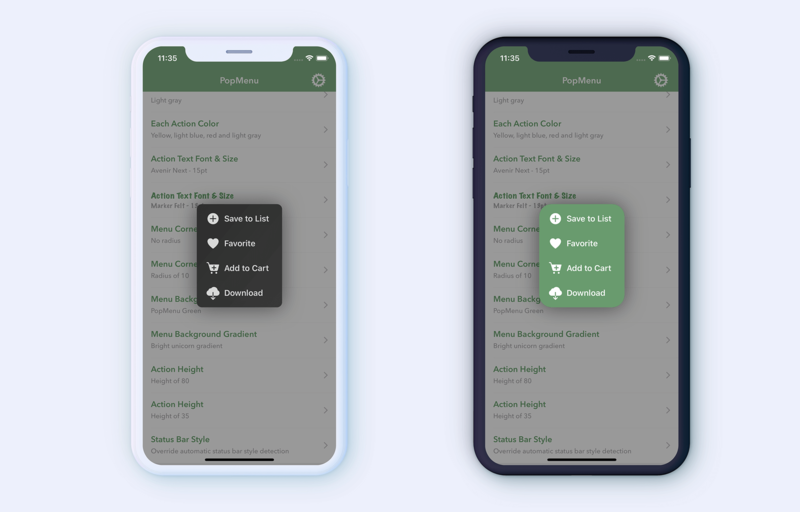 variable of PopMenuViewController called -> menu. manager.popMenuAppearance.popMenuFont = UIFont(name: "AvenirNext-DemiBold", size: 14)! menu.appearance.popMenuFont = UIFont(name: "AvenirNext-DemiBold", size: 14)! 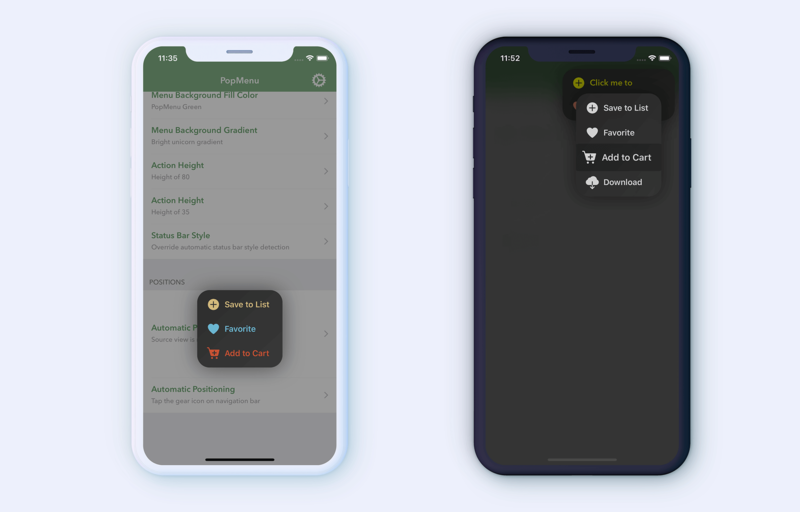 FlowKit is a new approach to create, populate and manage UITableView and UICollectionView. Full featured lunar calendar library.